ATP's Armor-Weld™ Spatter Resistant Polyurethane Tubing is specially designed for use in and around welding equipment or other severe-service applications. Armor-Weld™ is standard, ATP polyurethane tubing covered by an olefin, flame resistant layer. Its ether-based material gives it excellent hydrolysis properties making it suitable for use in water piping, as well as pneumatic piping and vacuum applications extruded from ether-based resin, providing excellent resistance to hydrolysis and oil. These double-layered tubing can be bonded together to create an ideal, color-coded solution for supply and return lines in robotic welding applications. The covering is separate from the inner tube and is easily stripped. 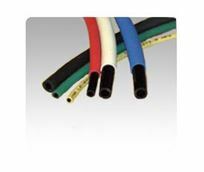 After covering is stripped, these tubing can be used with standard push-to-connect type fittings.